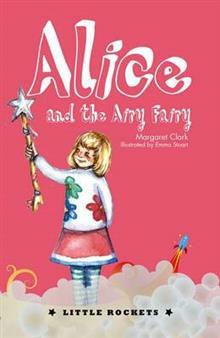 This lovely story opens with Alice learning that Mum’s cousin, Mary, is visiting. She’s coming to town because ‘she has problems’ and needs to stay till she’s ‘problem-free’. Dad say’s Mary is an airy fairy and Alice hopes this means she is truly magical because Mary may be able to cast a spell to make Alice’s baby sister Bonnie call her ‘Alice’ instead of ‘bum’. It seems that Mary is presently on the sad side of life and her drab artworks, which she hopes to sell at a local exhibit, reflect this. She lets Alice and Bonnie paint too and Bonnie copies Mary’s work, though Bonnie’s looks slightly less messy. When Mary becomes ill due to gall bladder issues and is hospitalised, Alice and Dad take her paintings to the exhibit. Gallery space limits displays to six works per artist and Dad unknowingly choses ones by Bonnie. He takes photos so Mary will be able to enjoy the display and, when they all sell, organisers ask for more. Dad brings Mary’s and they don’t sell. Alice hopes to delete the photos of those that sold and replace them with photos of Mary’s work but doesn’t manage to do so before Mary arrives. When Mary hears how well sales have gone Dad shows her the photos. She appears to be about to say that the works in the photos aren’t hers but stops. Alice keeps the secret and convinces Mary that perhaps art isn’t what she should be doing but that she should run fairy birthday parties for a living. Mary agrees. As incidents occur in the story Bonnie pipes in with new words she’s never said before. Though none actually mean anything in relation to the incident they add humour and, at story’s end, she says ‘Alice’ for the first time. Eighteen illustrated chapters in this title of the Little Rockets series ensure that the story gallops along at a pace that will be easily gobbled up by beginner readers aged 7+.